The Jackie Chan Stunt Team's 40th anniversary took place yesterday at the Jackie Chan art center in Beijing. Jackie Chan led the 1st to 8th generation, several dozens of members to a hand printing, tree planting and creating a plaque with the words, "loyalty, filial piety, chastity and righteousness". He also established a foundation in the name of the Jackie Chan Stunt Team. Jackie Chan wanted to honor the stunt team's contribution to action kung fu films during the anniversary event. Eric Tsang Chi Wai, Frankie Chan Fun Kei and Timmy Hung Tin Mng attended. Artist friends Zhang Guoli, Tony Jaa, Eddie Peng Yu-Yan and Jiang Wen sent videos to congratulate him. In the 10 minute video, Arnold Schwarzenegger, Yuen Biao, Feng Xiaogang and Sammo Hung Kam Bo talked about the Jackie Chan Stunt Team's past. In the documentary late members of the team including Fung Hak On were mentioned. Tsang Chi Wai was teary eyed after watching. He felt proud of the Jackie Chan Stunt Team and hoped Jackie Chan would continue to spread the Jackie Chan Stunt Team kung fu around the world. Chi Wai said, "I used to call him Jackie Chan or Big Nose, now I call him Big Brother very respectfully." Chi Wai also said that earlier after an all night shoot he took a flight to Beijing. Huang Lei and Sun Honglei bowed to him as soon as they saw him. Actually they watched a Mainland program on which Jackie Chan talked about the Jackie Chan Stunt Team and were touched. A fan presented the first generation Jackie Chan Stunt Team leather jacket and 90's tee shirt to Jackie Chan. Jackie Chan returned the favor with the latest Jackie Chan Stunt Team tee shirt. 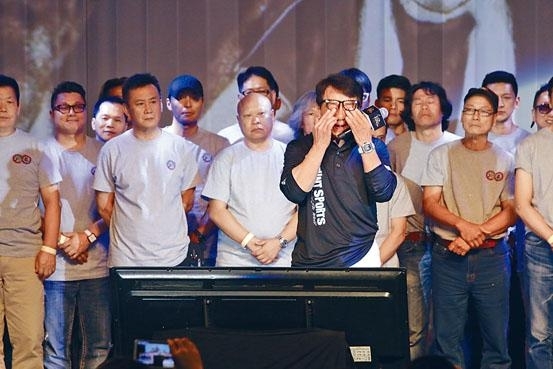 Jackie Chan said that he spent a year to prepare the event in order to honor the Jackie Chan Stunt Team's behind the scene effort and contribution. Would his son Jaycee Chan (Fong Cho Ming) succeed him? Jackie Chan said that his son wanted to operate his business and would not be able to take over. The Jackie Chan Stunt Team would. Last year he founded a Jackie Chan Stunt Team foundation. Jackie Chan revealed that Cho Ming's new record will be released in the summer, but denied that Cho Ming and Ouyang Nana were dating. They were reported only because of their fame. He admitted that he had dinner with Nana and praised her character. Jackie Chan also said that Chan Fun Kei has already recovered and has been working for him. Currently he is busy with the CHINESE ZODIAC 2 pre production work.